Data fusion is based on the principles of control systems. Each step of this processing is designed as a control process, and is piloted by theoretical models used as a set of commands. A cascade of commands / controls processes allows the retrieval of a wide range of geophysical parameters characterizing the environmental situation, using the physical complementarity between the two sensors (here the complementarity is provided by different polarization configurations of the incident radar waves emitted by the two SAR's). Low resolution (100x100m). Green: texture component of the two SAR images. Red: soil roughness channel. Blue: soil moisture channel. This image is the result of data fusion using two images acquired by two different Synthetic Aperture Radars (SAR): the C-HH band SAR onboard the Canadian RADARSAT-1 satellite (February 13, 1996), and the C-VV band SAR onboard the European ERS-2 satellite (February 14, 1996). 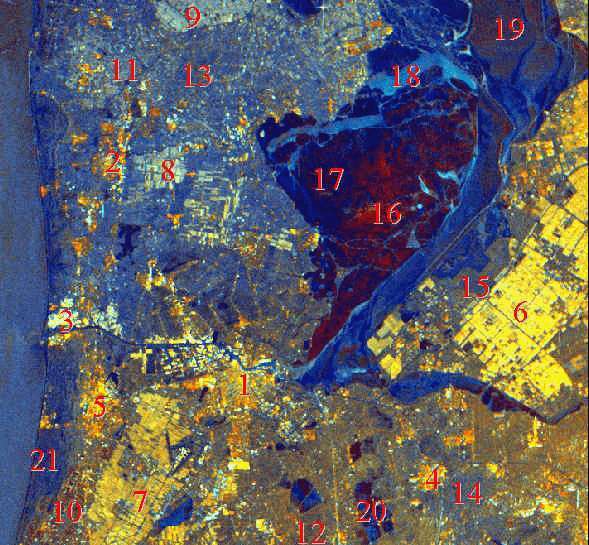 The surveyed area is the southern part of The Netherlands (64 km x 55 km), centered around the city of Amsterdam. Note that during most of the winter this area is often covered by clouds which hinder the acquisition of useful optical or near infra-red satellite imagery. The green, red and blue channels are formed using control system based processes. The green channel is formed during the multi-channel filtering process which is itself a controlled process that implies data fusion aspects. The red and blue channels are produced using physical models describing the concerned geophysical parameters. to retrieve a quantitative evaluation of soil moisture and soil roughness (blue: soil moisture map, red: soil roughness map) to integrate into an agro-meteorological model for continuous monitoring of crop growth and update of crop yield forecast. E. Nezry, F. Yakam-Simen, I. Supit and F. Zagolski, 1997: "Retrieval of environmental and geophysical parameters through Bayesian fusion of ERS and RADARSAT data", Proceedings of the 3rd ERS Symposium, Florence (Italy), 17-21 March 1997. The climatic difference between the northern and the southern part of Holland are emphasized in this representation. Note that the two acquisitions have been done in two days. This methodology has been developed in order to provide an answer to an issue which concerns, sometimes dramatically (natural hazards, etc. ), the decision-makers at the regional or local scale. This issue is the very rapid (in real- or near-real-time) evaluation of a global situation, with regard to a very wide variety of aspects. With its research progresses, ParBleu Technologies Inc. and its partner company Privateers NV are ready to provide responsible decision-makers with a service or/and with the tools which would enable them to evaluate with the due rapidity the impact of critical situations such as floodings, natural hazards affecting agriculture, etc.